The SODAQ Mbili has two hardware serial connections Serial & Serial1. Serial is the USB connection and Serial1 the connection to the Bee module. They are also connected to two of the Grove sockets. See here for details: Grove sockets. 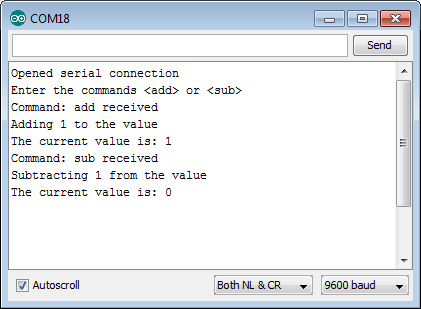 In this tutorial we will discuss sending data over a serial connection (USB) between the SODAQ Mbili and a connected PC. This can be a useful way of displaying debug data (in the Serial Monitor) or for sending commands to the device. To open the serial connection to the PC a call must be made to Serial.begin(speed). The parameter speed specifies the bits per second or baud rate. This must match the baud rate set in the Serial Monitor or in the terminal emulator program you are using. Similarly a call to Serial.end() will close the connection. Each of these methods read varying amounts of data from the incoming stream buffer and either return that data directly, or in the case of readBytes() writes the data into the supplied parameter buffer. The data which is read is also removed from the incoming stream buffer. Here we define a delay value which is used to control the effective frequency that the sketch checks for any new incoming data.We also declare a global variable, value, which we will modify via commands sent from the PC. In the setup() method we first open the serial connection. This is done with a call to Serial.begin() on the hardware serial object Serial. We then use the output method println() to write two strings to the outgoing stream buffer. Here we check if there is any data in the incoming stream buffer. This is done with a call to Serial.available() which returns the number of bytes (characters) which have been received and are currently held in the incoming stream buffer. If the returned value is greater than zero then we call the user defined method handleInput() which processes the incoming data. We have also added a small delay by calling the method delay(). This affects how quickly the sketch responds to data received over the serial connection. Note: An alternative way of handling the data in the incoming stream buffer would be to use the automatically triggered method serialEvent(). This user defined method handleInput() is called from loop() if any data is detected in the incoming stream buffer. Here we read the data into the String input using the method readString(). This copies the data from the incoming stream buffer and stores it in input. It also clears the stream buffer of the data it copied. We then use trim() to remove any additional termination characters which might have be added by the terminal program. Using the String comparison operator == we compare the received command against the two specified ones and then modify value accordingly.